Upper Intermediate level. Over 32,000 terms clearly defined. Second Edition. - Bloomsbury Publishing PLC, 2003 - 1024 pages. 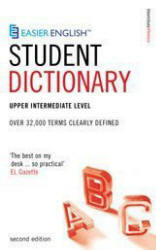 The fully revised and updated edition of this bestselling general English dictionary is especially useful for those working towards FCE (First Certificate Examination), and IELTS (International English Language Testing System) examinations. The new edition includes 28,000 expressions used in international English. The selection is based on word-frequency counts and analyses of the CAT (Certificate in Advanced English) exam syllabuses. Entries include examples from everyday speech, irregular forms, derived words, differences between English and American usage, and help with confusable words (e.g. insure and ensure). Encyclopedic comments highlight historical and cultural terms (Guy Fawkes, Pancake Day) and technical terms such as the periodic table, the metric system and greenhouse gases. • Each entry includes part of speech, phonetic pronunciation guides and example sentences showing how terms are used.